One day in June 2003, Kirsten Hoving hopped a flight from Burlington to Washington, D.C. She planned to spend a few days picking through a dead guy’s junk. Most would not jump to do such an errand. But in Hoving’s case, the dead guy was famed 20th-century artist Joseph Cornell, and his junk lived in the Smithsonian American Art Museum. 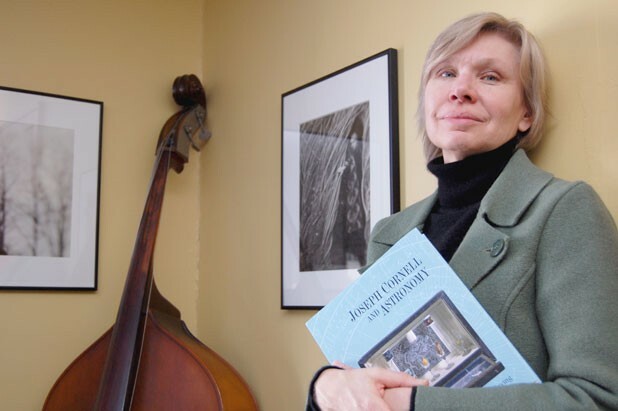 Hoving, 57, who teaches art history at Middlebury College, told a Smithsonian curator she was writing a conference paper on the New York artist. The curator suggested she peruse 200 boxes filled with Cornell’s seashells, birds’ nests, wooden cubes and annotated copies of The New York Times. Not all of Cornell’s quirky junk proved useful — what do scholars do with so many boxes of birds’ nests? But Hoving really dug Cornell’s annotated Times archive. Discoveries she made in his newspaper files at the Smithsonian prompted spin-off research trips to New York, Atlanta, London and Venice. Her conference paper, meanwhile, mushroomed into a 336-page hardcover book, Joseph Cornell and Astronomy: A Case for the Stars. The product of a year’s sabbatical, a grant from the National Endowment for the Humanities and a generous helping of caffeine, Hoving’s book shows how Cornell’s interest in the cosmos inspired him to create his signature assemblage box creations. Cornell died in 1972. His interactive, three-dimensional dioramas explore such disparate topics as parrots, French ballet and Newtonian physics, and they may look like closed worlds unto themselves. (Imagine a freeze-frame of a sophisticated marionette show with impossibly obscure props.) Yet Hoving argues, in seven meticulously researched chapters, that the artist was more engaged with popular culture than other scholars think. Joseph Cornell’s legacy, as Hoving would discover, is a tricky one to pin down. His art recalls works by fellow 20th-century surrealists Man Ray and Marcel Duchamp, while also anticipating those of Robert Rauschenberg, Jackson Pollock and Andy Warhol. To some, the Flushing native’s famously weird boxes look silly and immature. Others — including Hoving — see his miniature worlds as elegant products of a brilliant mind. Despite his low profile, Cornell was a cult icon by mid-century. Although he never married or moved out of Mom’s place, he hobnobbed with such artsy luminaries as Peggy Guggenheim, Pollock and Yoko Ono. Today his boxes, collages and experimental films are stored in major museums, and chapters of his curious life have been recounted in more than 20 catalogues and books, including a witty, critically acclaimed 1997 biography by then Wall Street Journal art critic Deborah Solomon. Hoving’s scholarly analysis isn’t as lively as Solomon’s 426-page portrait. But the Middlebury professor does show how Cornell channeled his starry interests into space-inspired boxes. While Cornell wasn’t a scientist, Hoving writes, he was a consumer of pop astronomy tomes and New York Times science articles; factoids from those sources made their way into his art by aesthetic osmosis. And, like many Americans of his era, he was a pop-science junkie. Consider Cornell’s landmark 1936 assemblage “Soap Bubble Set,” in which a serpentine white pipe rests behind an antique French moon map inside a glass-enclosed 15-by-15-inch box. Hoving says the moonscape is a nod to Galileo, who studied lunar matters. But the box isn’t just a throwback to the distant past; the funny-looking pipe references then-current science. Science was a common thread in Cornell’s work as it evolved, says Hoving. In the 1960s and ’70s, for example, he riffed on the U.S.-Russia space race with surrealistic collages such as Untitled (Triangles and Distance to the Moon). To a lay viewer, this 16-by-13-inch piece of quirky social commentary — the collage juxtaposes a plastic doll, a cutout of the moon and a pinkish sunset — seems like a departure from Cornell’s old-timey “Soap Bubble” period, in which the artist masked his ideas in denser layers of symbolism and metaphor. But, like the earlier pieces, Untitled also features cosmic symbols and a mysterious night sky. This isn’t the first time Hoving has combined her art scholarship with a passionate interest in what’s “out there.” Before embarking on this book project, she wrote an article titled “Outer Space and Artist’s Space in Pollock’s Cosmic Paintings,” which assessed night-sky paintings by the late painter. Such passages reminded Hoving of her childhood. As a young girl growing up outside Philadelphia, she stargazed with her father. In those days, she recalls, the view of the heavens wasn’t compromised by light pollution, as it is now in most suburban areas. Fortunately the atmosphere is clearer in Hoving’s adopted hometown, where undergraduates chart stars en plein air, and the night sky over campus is occasionally blessed by shimmering northern lights. While it may be partly a labor of love, Hoving’s book also reflects a recent trend in art history, says Linda Dalrymple Henderson, an art history professor from the University of Texas at Austin. Basically, that trend involves seeing works in a rich cultural context, which includes seemingly wonky disciplines such as astronomy. Five years ago, Henderson organized a national meeting of art history buffs aimed at “rethinking” space and time through science, literature and the arts. In a phone interview, she says appreciation for cultural history has returned to the academy since the theory-heavy 1980s and ’90s, when some scholars saw art as a mere succession of “styles” unrelated to larger cultural forces. Hoving says she’s relieved to be done with her book, but that doesn’t mean she’s finished with Cornell: Hoving is considering a new book project on the artist’s largely unstudied experimental films. And, she notes, there’s plenty more archival material to be mined in those boxes at the Smithsonian. There may also be a contemporary audience for the insights that emerge from the detritus of one man’s quiet yet extraordinary life. Hoving, whose current book was recently on display at New York City’s Whitney Museum of American Art, believes Cornell is still popular because his boxes offer adults a “sense of refuge” from the perils of the world. Joseph Cornell and Astronomy: A Case for the Stars by Kirsten Hoving. Princeton University Press, 336 pages. $49.50.